This brings us to the G4, the successor to the G3. 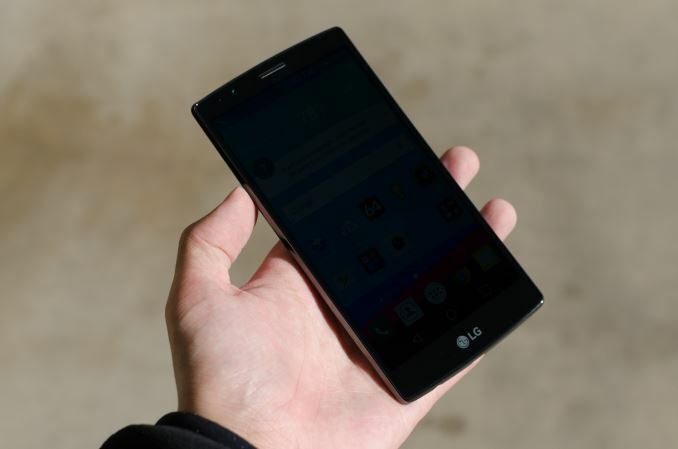 The LG G4 is effectively an evolution of the G3, as we’ll see in the specs below. At a high level, the major changes here have been the upgrade from the Snapdragon 801 to 808 SoC, the new “Quantum IPS” display, and a whole host of changes to the camera that seem to be the focus of the LG G4. The camera seems to really be the centerpiece of this phone, as LG has upgraded the sensor (IMX135 to IMX234), updated the optics, improved the OIS even further, and added a color sensor that looks at visible and IR spectrum to help determine white balance. As previously discussed, the G4 is very much an evolution of the G3, and this is most apparent when looking at the design of the G4. From the front, there’s relatively little that distinguishes the G4 from the G3, other than a change to the bottom bezel. The design of the phone retains its relatively thin bezels, although the removal of the two-tone bottom bezel definitely makes it feel like the bottom bezel has gotten larger. In the hand, the most noticeable change is that the corners are now noticeably more squared-off in nature. This definitely makes it harder to use the phone with one hand, to the point that I don’t really think this phone is supposed to be used with one hand. This relatively small change ends up pushing LG over the edge for me when it comes to one-handed usability. I managed to just barely use the G3 with one hand all the time, but with the G4 anything on the left side of the display is now a real stretch to get to, and I basically can’t reach the top-left corner of the display if I’m only using the phone with my right hand. 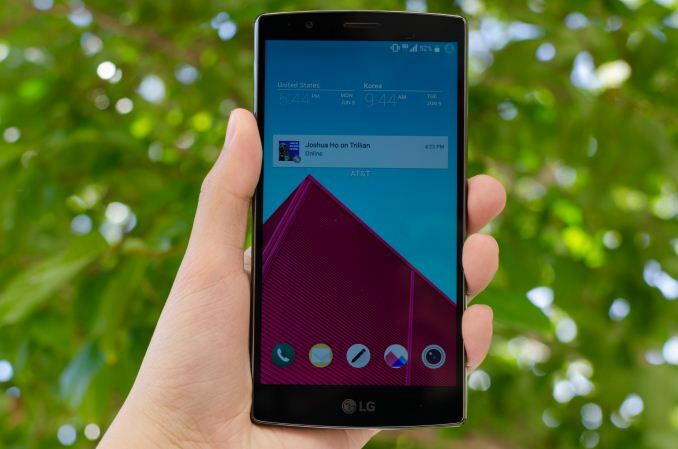 The LG G2 was a comfortably one-handed phone, and the G Pro 2 was a comfortably two-handed phone. The G4 ends up right between those two difference usage paradigms, where some situations allow for one-handed use without issue but others definitely require two hands. At any rate, for those that liked the size of the LG G3 and OnePlus One they’ll probably be right at home with the G4. 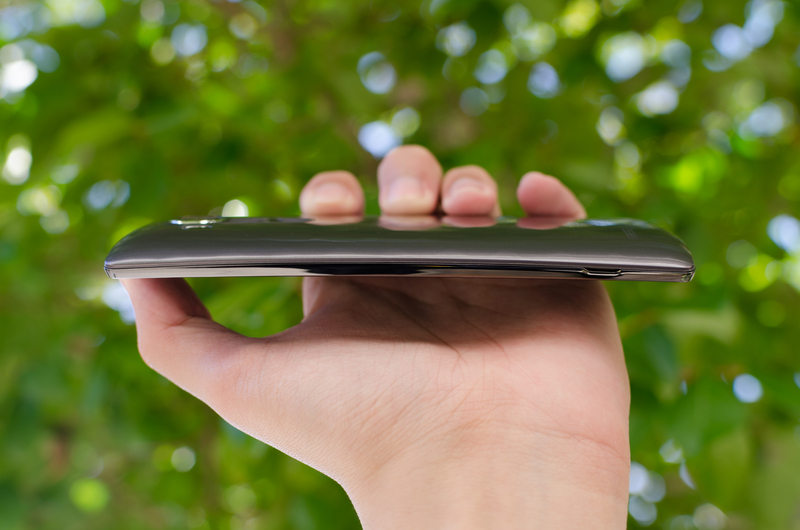 The whole phone also has a noticeable curve to it, at a radius of 3000 mm. This radius of curvature is incredibly subtle and in everyday use the phone looks flat, unlike the aggressively curved display of the Galaxy S6 edge. In practice, the real benefit of this curve is to keep the display from touching the surface of a table if the phone is set face-down. The front of the display merges with the side plastic frame, which is slightly higher than the glass to also help somewhat with drop protection. The side plastic frame itself is nothing particularly special to discuss, and is arguably a bit of a regression in feel compared to the G3 due to the glossy nature of the finish. The top of this frame has the IR receiver and transmitter to control TVs and similar appliances, and the bottom has the microUSB port, 3.5mm headphone jack, and a single microphone hole, but there’s otherwise nothing else along the sides of the phone. The rather clean sides are due to the use of rear-mounted power and volume buttons, which is a trademark of LG phones at this point. The back of the phone is really where most of the changes are on this phone relative to the G3. The dual-tone LED flash is gone, and there’s a color spectrum sensor (RGB + IR) where the amber LED used to be. There’s also a camera hump to accommodate the thicker optics that come with a larger camera sensor, and the back cover has been redesigned on the plastic versions to have a diamond pattern which doesn’t noticeably affect the feel but causes a visual contrast that helps to distinguish this phone from the G3. Unfortunately, we haven’t been sampled the leather back cover so I don’t have anything to really discuss on that front. The single speaker of the phone is also on the back, and appears to be comparable to the G3. 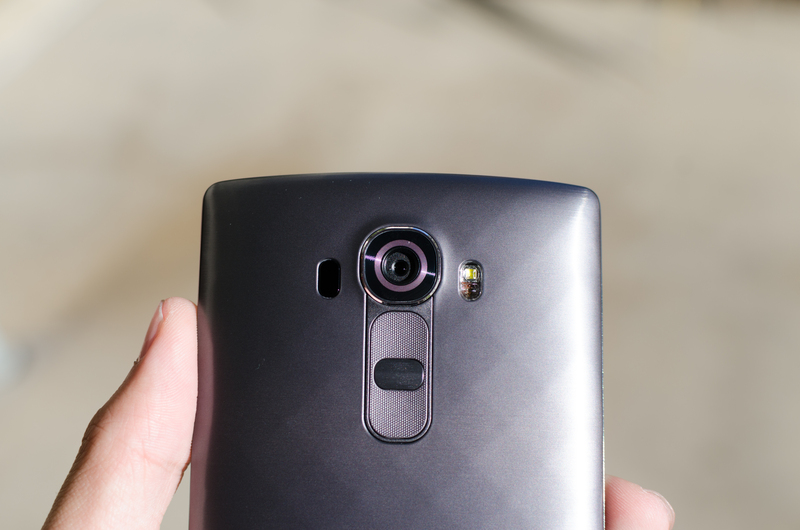 Overall, the design of the LG G4 is decent, but it won’t necessarily impress in the way that the Galaxy S6 might. 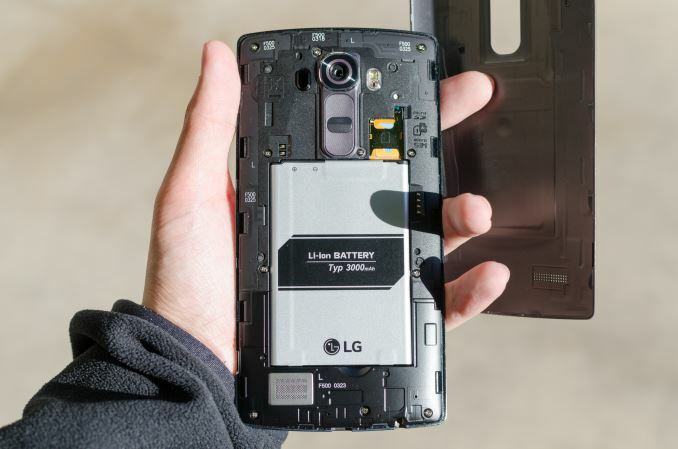 LG has managed to execute a plastic-bodied phone that doesn’t have any notable issues with look or feel, and given that this build enables a removable battery and microSD slot those that find those features to be a necessity will probably accept this trade-off. I personally would’ve liked to see the speaker either moved to the bottom or front of the phone, but LG has managed to evolve the design of the G3 without any noticeable regressions. I was also expecting to see some sort of a technical comparison here related to the SD 808 vs. the SD 810. I for one also think the 1440 screen is overkill, especially in a sub 6" device using the SD 808.